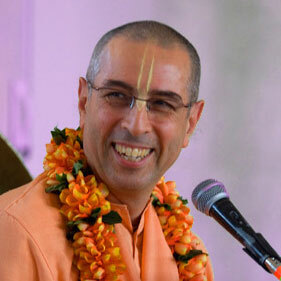 His Holiness Niranjana Swami is a Vaishnava sannyasi, initiating guru and a governing body commissioner of the International Society for Krishna Consciousness. He was born on December 10, 1952, in Lowell, Massachusetts, USA. In 1972, his spiritual search took a turning point when he saw a Bhagavad-Gita As It Is, on the counter of a bookshop in Washington, DC. After completing his study of the "Gita", he continued his research of Gaudiya Vaishnava philosophy by purchasing and reading several other publications from the same author, His Divine Grace A.C. Bhaktivedanta Swami Prabhupada. During this time, he returned to Massachusetts, continued his work as a house builder, and simultaneously pursued further studies by regularly visiting the Boston ISKCON temple. By mid-1973, he accepted a monastic life, moved into the Boston temple, and accepted initiation from his spiritual master, His Divine Grace A.C. Bhaktivedanta Swami Prabhupada, in the early spring of 1974. Soon thereafter he received brahminical initiation. In 1986, at ISKCON's world headquarters in Sri Dhama Mayapura, West Bengal, His Holiness Niranjana Swami accepted the renounced order of life, sannyasa. Since that time, wishing to satisfy his spiritual master, Niranjana Swami has been traveling extensively throughout North America, the former Soviet Union, and India, lecturing on the teachings found within the books of His Divine Grace Srila Prabhupada.